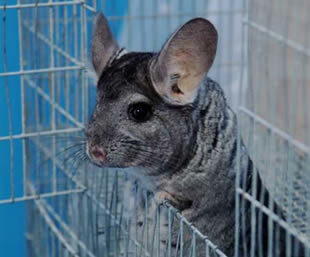 Our pet chinchillas are our pride and joy. They are our babies and get lots and lots of attention each and every day. We have four chinchillas: Roo, Fipsy, Schmoopy, and Sully. Roo is the chinchilla pictured on this page. She's our princess. If Roo doesn't get attention then NO chinchilla gets attention (she makes sure to let us know that). Roo's favorite activity is running in circles around the house and jumping off the walls. She loves to be picked up out of her cage because she knows that playtime is coming. Fipsy is Roo's son. He is three years old, and has a ton of personality. Fipsy loves to come out of his cage and sleep with his human mommy and daddy in the "big bed." He's a little stinker though, because he doesn't like to be picked out out of the cage, he likes to let himself out (while his humans watch in dismay as he takes off through the kitchen). Fipsy loves to have his chin scratched, and to get yummy treats like prunes. Schmoopy is Roo's daughter. She is just a few months younger than Fipsy. Schmoopy loves treats, and you can distract her from anything by offering her one. She sleeps in a hammock which hangs in the top of her cage, and loves to come out of her cage and play. Schmoopy's favorite thing to do is sneak around with the lights off where no one can find her. Sully came to us just a few month ago from Kansas City. He had a nice home there, but his human was a chinchilla breeder, and he had to share his space with over 90 other chinchillas! Since coming to us, Sully has learned how much fun it is to play outside the cage. He also enjoys sleeping in his hammock and has just started to use his wheel. Shreaded wheat is still his favorite treat though.